Curiosity is a robotic, car-sized, nuclear-powered, mobile scientific laboratory, Mars rover. Built by Boeing, Lockheed Martin and MacDonald Dettwiler, Curiosity weighs in at approx 900 kg (2,000 lb) including 80 kg (180 lb) of scientific instruments. 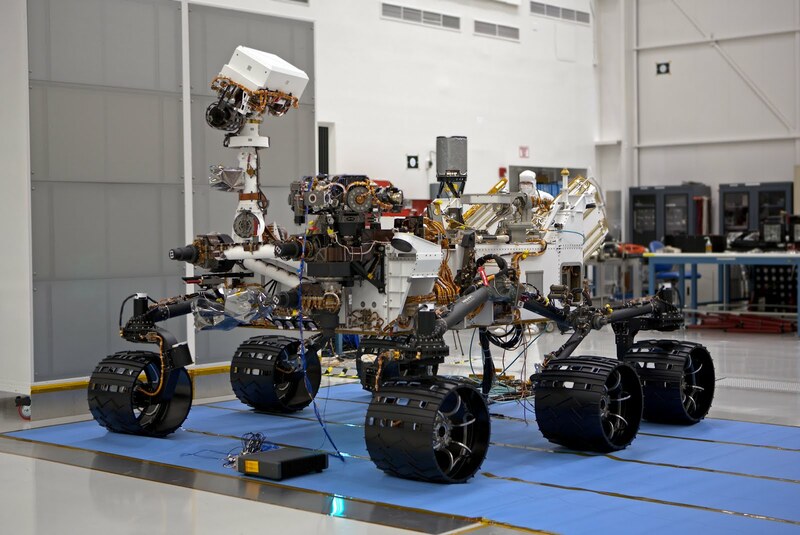 Each of the rover's six wheels has an independent wheel motor. The two front and two rear wheels have individual steering motors which allow the vehicle to turn in place. Instead of PV solar panels as used on the previous two Mars Rovers Spirit and Opportunity, Curiosity is powered by a radioisotope thermoelectric generator (RTG) which generates 2.5 kWh per day, much more than the Mars Exploration Rovers' solar panels, which can generate about 0.6 kWh per day. The plutonium-238 based RTG will power Curiosity for 14 years without refuelling.